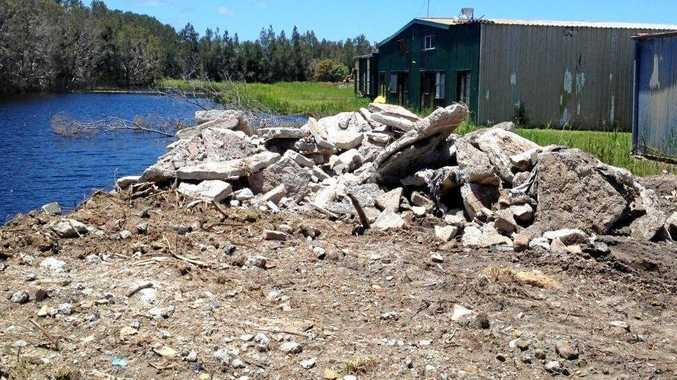 Some the rubble council claims has been dumped at the Noosa airfield. A LEGAL stoush over a stack of dumped rubble and unapproved vegetation clearing on Noosa Airport could be about to take off in the Planning and Environment Court. Noosa Council development assessment manager Kerri Coyle has proposed councillors continue to enforce its alleged breach of the planning scheme. "Noosa Airfield have now lodged an appeal against the enforcement notice on technical grounds submitting that the notice is deficient, unlawful and invalid,” Ms Coyle said. And the council may be about to ratchet up the pressure on the operator after a review of the airfield use approval was undertaken and found it had lapsed. "This review showed that the original town planning consent for the use expired many years ago and that a subsequent rezoning approval in 1994 to special facilities was never completed,” Ms Coyle said. Ms Coyle said the issue will be further discussed with the council's solicitor for planning matters on how best to proceed. "As for the alleged dumping and clearing breaches, she said in November 2017 the council received complaints about numerous trucks carrying fill material travelling to Noosa Airfield. Ms Coyle said it confirmed that significant uncontrolled fill of concrete and earth as well as builders demolition materials had been placed into a man-made waterway at a number of locations. She said vegetation had also been removed from a lot adjacent the airfield on the south-eastern side of the access driveway.